There was an article about me on the Spectator’s book blog yesterday, written by Walter Ellis, who has his own book out – London Eye. It has had some quite brilliant reviews. But that does bring me to the good and bad things about “success”. I have written before that I never set out to “become an author”. I wrote something to prove to myself I could and, once that was done, I put it out into the market to let it sink or swim. I had no real expectations but everything that has happened to me is pretty amazing. 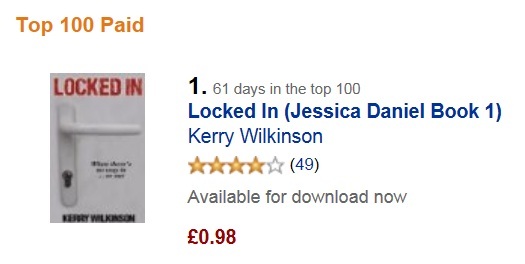 I have been the number one book on Kindle for ten days now, while Locked In‘s sequel, Vigilante, has been in the top-10 for most of that time. What that brings with it is a lot of interest. Much of it has been positive, some of it negative. Things like that article in the Spectator is one of the positives. As for the negatives… you learn to live with bad reviews. Some are constructive and raise valid points, some are borderline abuse and jealousy. I think most people take the reviews – good and bad – with a slight pinch of salt. A few days ago I received an email from someone which, on the surface, was very nice. The person said they liked my books and congratulated me on their success. They then asked if I could have a look at their title, which was listed through Kindle and they invited me to read it and review it. I did have a look at their listing and it seemed all right. I politely replied, thanking them for their email and said that their book sounded interesting. But I did say I was very busy because I have a full-time job alongside my writing. I said I might take a look at their book, and review it, in future – but that I couldn’t promise anything because I don’t get much time. Within five minutes, the person replied saying that, if I didn’t give his book a five-star review, he would retaliate by giving mine a one-star one. I didn’t really know how to reply, so ultimately ignored it. Within 24 hours a one-star review had indeed appeared. It doesn’t refer to any plot points and paraphrases a couple of the other reviews, so I have no idea whether the person has actually read the book or not. Ultimately, I think most readers are intelligent enough to see through the reviews which sound as if they are making a point but don’t speak in specifics. I have had good and bad reviews and it’s obvious some people really like the book(s), while others do not. That is entirely their prerogative but I thought I would mention some of the tricks which people employ. Among the many, many plus points of everything that has happened to me in the last three months, this is a very minor blip. But I guess it shows the other side of making yourself accessible. NB: People may ask why I don’t contact Amazon about that review. I have contacted them twice before about reviews. It’s not to do with good/bad reviews. One was very abusive to me personally (even though the writer was a stranger), one revealed all of the plot details without tagging them as spoilers. Both reviews fail to meet Amazon’s own review guidelines. Guess what? Amazon refused to remove either, essentially saying they want to cultivate a diverse set of opinions. Diverse is one thing – abusive is another. In the end, the writers edited their own reviews, perhaps realising it didn’t make them look very good either. I’ve had many great experiences with Amazon – but asking them to look at reviews, even when it is clear their own guidelines have been breached, has not been one of them.